Presented as new (used twice) my Simpsons Major travel brush. Below is the stock photo and description including retail price. 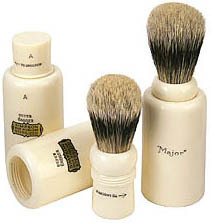 An ingenious but simple traveling shaving brush designed for the intrepid Himalayan explorer Major Victor Beeching. The shaving brush screws into an open ended tube allowing the brush to breathe within a wetpack or washbag and is perfect for traveling. Entirely turned and tapped by hand, the Major is a work of art as well as a shaving brush. Since each pair is unique, they are not interchangeable with other tubes. The actual brush. As stated it was used twice on this trip. Here is a bad photo of the actual brush on my last trip. Do you have anything left in your den????? (04-24-2014, 12:39 PM)wingdo Wrote: Do you have anything left in your den????? Yes I do. 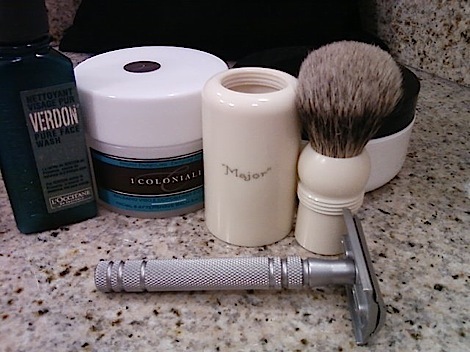 The Simpsons P8, the Semogue TSN 2012 LE, the Omega Midy Midget Silvertip, 19mm EJ synthetic (my new travel brush) and 4 Muhle synthetics. Oh, and I have one very large boar that Omega made for a facebook shaving forum. That price is a steal for that brush.